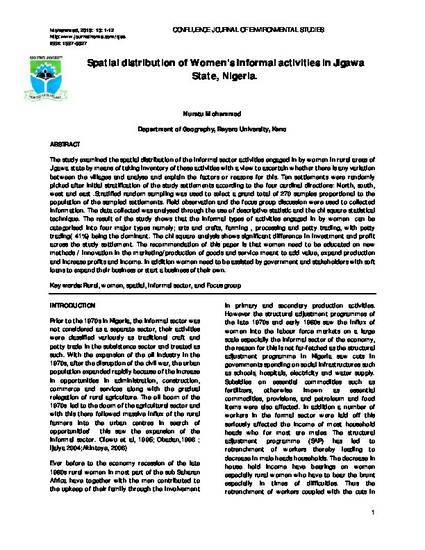 The study examined the spatial distribution of the informal sector activities engaged in by women in rural areas of Jigawa state by means of taking inventory of these activities with a view to ascertain whether there is any variation between the villages and analyse and explain the factors or reasons for this. Ten settlements were randomly picked after initial stratification of the study settlements according to the four cardinal directions: North, south, west and east .Stratified random sampling was used to select a grand total of 270 samples proportional to the population of the sampled settlements. Field observation and the focus group discussion were used to collected information. The data collected was analysed through the use of descriptive statistic and the chi square statistical technique. The result of the study shows that the informal types of activities engaged in by women can be categorised into four major types namely; arts and crafts, farming , processing and petty trading, with petty trading( 41%) being the dominant. The chi square analysis shows significant difference in investment and profit across the study settlement. The recommendation of this paper is that women need to be educated on new methods / innovation in the marketing/production of goods and service meant to add value, expand production and increase profits and income. In addition women need to be assisted by government and stakeholders with soft loans to expand their business or start a business of their own.